There is both science and an art to mixing colors together to create new and fresh paint colors. Red, yellow, blue, black and white colors can be used to replicate any color or hue in the rainbow. Allow the children to get messy and experiment with mixing primary colors to reveal secondary colors such as green, purple and orange with a variety of materials. Instruct each child to wear an art smock to avoid getting their clothing messy, roll up their sleeves and create some color. During the fall season, mix paint with your preschoolers to make an orange pumpkin package. Give each child a plastic sandwich bag with a double seal for added safety and allow each to draw a pumpkin on the front of the bag. For younger preschoolers, the teacher may draw one for them. From two disposable bowls, each with either red or yellow paint, children can spoon a bit of each color into the plastic bag. Teachers can ensure that the bag is properly sealed to avoid any seeping paint, and with no added air in the bag. Allow the children to move the paint around to create a bright orange pumpkin. Read the literary work "Mouse Paint" by Ellen Stoll Walsh with your students. In the book, the mice mix colors to create new ones by dancing in the paints. 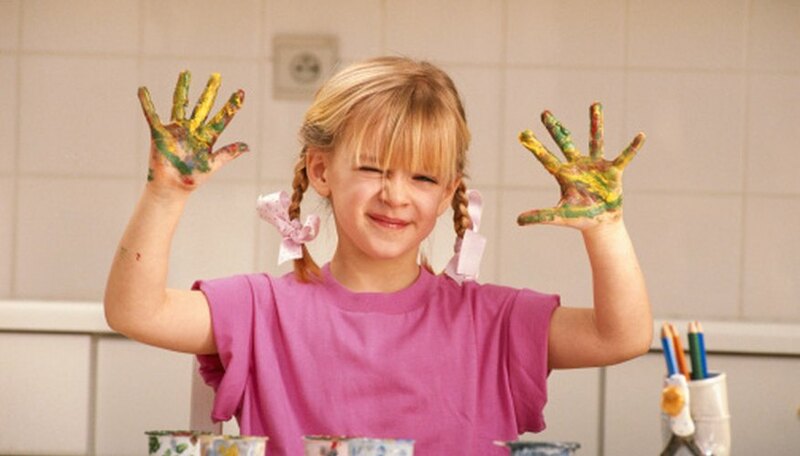 In groups of three and on large pieces of white painting paper, children can spoon red, blue and yellow paint puddles and use only two fingers to "dance" in the paint. Through the movement of two index fingers, the three children can mix paint colors to reveal orange, green and purple shades. Leo Lionni is a children's book author whose works include "A Color of His Own." Draw, trace or print an outline of a chameleon for each child to use in creating a paint-mixing art project. The students can use clean medicine droppers to squirt drops of paint onto the chameleon, and a straw to blow the colors into one another, resulting in the mixing of colors just like the chameleon in Mr. Lionni's book. Mix powdered tempura paint and vegetable oil in a clear, clean soda bottle. 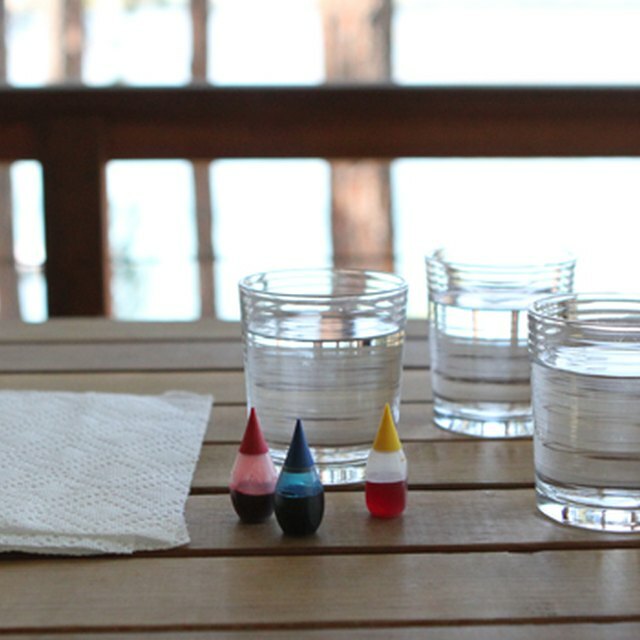 Combine food coloring and water in a disposable cup; this is then poured into the plastic bottle and the cap secured with super glue or a hot-glue gun. The children can help in funneling the colors into the bottle but the teacher always handles the gluing. The children shake the bottle, combining the colored oil and water to create a new color that separates quickly again for more color-mixing play. To create one shaker for each student, use clear, glass baby food jars and a smaller amount of oil and water. Freeze watered-down tempura paint in an inexpensive ice cube tray; black, white and the primary colors should all be represented. Allow the children to experiment with all five ice cube colors on a piece of thick construction paper, mixing them as they rub them across the art surface. The students then identify the colors they each have created such as pink, baby blue, lavender, orange and lime green. Due to the absorbent nature of coffee filters, they represent one of the most efficient color-mixing materials. Using water dyed with nontoxic food coloring, each child can dab a small sponge, straw or eye dropper into the colors and place the drops of water onto the coffee filter next to one another. It may take a few moments for the colors to spread through the coffee filter but each primary color mixes with one another to create a colorful marbled effect. Dawe, Trisha. "Color-Mixing Paint Activities for Preschoolers." Sciencing, https://sciencing.com/colormixing-paint-activities-preschoolers-8134532.html. 25 April 2017.